After many weeks struggle, finally I finish the new firmware for the screen, this new firmware mainly improve the boot up speed of the screen, old one takes six seconds, new ones less than one. Also add control function to modify backlight strength and support 8bit/16bit/24bit pixel format. 1. Linux text console which is based on frame buffer 16bit or 32bit, old firmware only support 24bit. 2. super smooth games from GBA, NES, GEONEO. We support 8bit mode, now we have more CPU for game logic but not for screen data transfer. 3. smooth games from DOS. DOS games such as DOOM will be faster, such game 12fps is playable, new firmware will make it at least 15fps. 4. control rotate the screen, backlight. The main optimize is for VoCore2 or other embed device with USB port but no display port such as HDMI. This solution will greatly save cost. For example, a chip with display port normally is over 5USD, it is not included DDR and flash yet, full solution with wifi, ethernet should be around 35USD, a screen with HDMI is around 25USD. So mass production is 60USD/pcs 10K unit. For VoCore2 solution, only 33.99 + 17.99 = 52USD, this is just sample price! 🙂 mass production(1K unit) normally have 40% discount, totally cost should be around 30USD, only half! What you will get for 30USD? 580MHz Linux based computer + 5 x 100Mbps ethernet + 150Mbps wifi + smooth UI display. It is fit for the control system, education toy solution for kids, also a good replace STM32 or RaspberryPi. This entry was posted in VoCore on 2018-11-02 by vonger. Combine VoCore2 Ultimate firmware to latest openwrt is always one of my dream. Today I start first step. 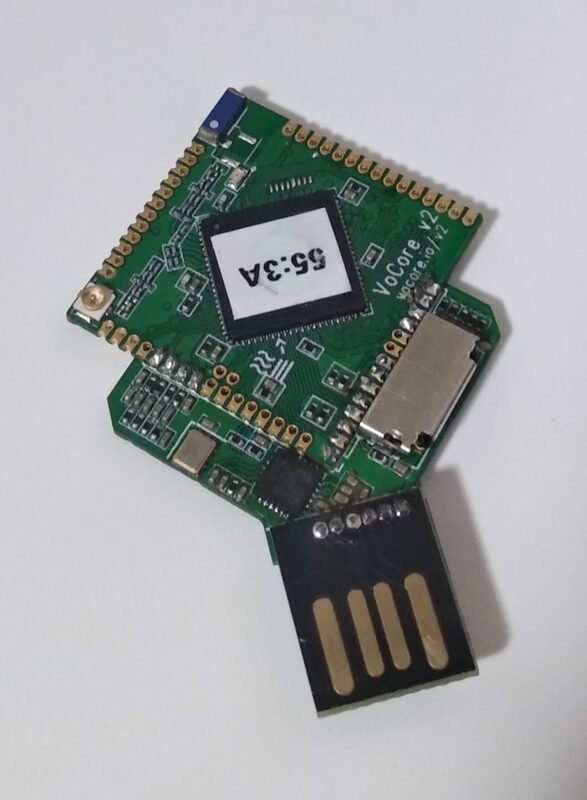 VoCore2 ultimate has one driver is different than the single board version, it is ES8388 codec driver, but limited to my patch skill, it is so hard for me to patch it to openwrt system. After port mediatek wireless driver, I understand some of the secret now, so I can push the first version of es8388 driver to github/vonger/vocore2. rest is dts, VOCORE2.dtsi I change refclk pinmux from gpio to gpio refclk, so gpio0 pin will work as 12MHz clock. after patch everything and use the new dts then compile and flash to V2U(a lot of work), you can now try it. 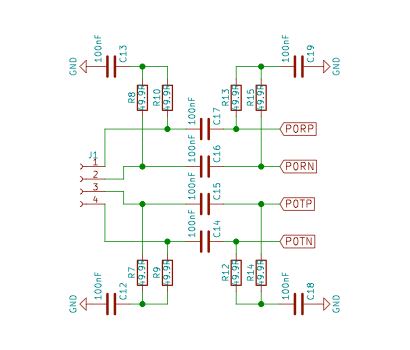 in /sys/devices/platform/i2c-gpio/i2c-0/0-0010/ there are two file node named i2cread and i2cwrite, used to directly write to es8388 i2c driver and control the codec directly. PSS: second four lines because I can not find a way to raise volume in aplay, in madplay volume works normal, if you use madplay, ignore those four lines. PSSS: recently github transfer speed is really fast, normally only 100KB/s, have to wait almost two hours…lol, should we thanks to Microsoft? This entry was posted in VoCore on 2018-10-10 by vonger. 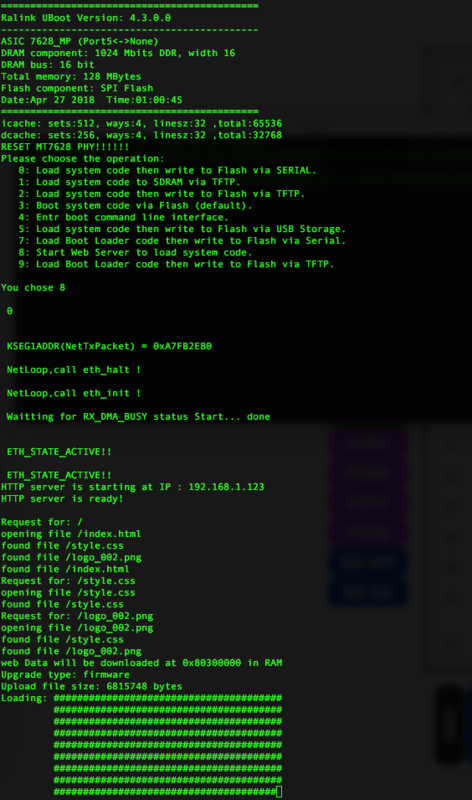 I find another way, “8: Start Web Server to load system code.”, only take few seconds(40~60s). Here is its log 🙂 Anyway we do not need to care about it, only need to press 8 at start up. After press 8, we can connect to VoCore uboot web page from remote computer now. Make sure your computer and VoCore are connected by ethernet cable. Your computer side: need to setup your computer ip address to 192.168.1.100, mask 255.255.255.0 and default gateway to 192.168.1.123, remember disable DHCP and setup manually. Then open browser to address 192.168.1.123, you will see the upgrade page, choose upgrade file(normally VoCore2 upgrade firmware named YYYYmmdd(V).bin) then click on “Upload”(on VoCore2 part it will show Loading … and its progress), around 1minute, load done and VoCore will reboot automatically. This entry was posted in VoCore on 2018-07-26 by vonger. 1. Click on “Scan”, it will show nearby access point, this mode is STA only, better to setting up in Point 2 to enable AP + STA. 2. Click Point 2, go to wireless setting. In “General Setup” page, input your AP SSID. Then in “Wireless Security”, setup your password, currently only WPA2 supported. 3. After that, click “Save & Apply”, then enable STA mode, wait around 10 seconds, setting up completed, now your VoCore can access internet. This entry was posted in VoCore on 2018-07-23 by vonger. This entry was posted in VoCore on 2018-07-17 by vonger.